Car Window Tint Shades: Which Option Is Best for Your Vehicle? Home Car Window Film Car Window Tint Shades: Which Option Is Best for Your Vehicle? Nothing is worse than getting into a hot car on a sunny summer day. As temperatures rise, the more sun your car gets, the hotter the interior will be. Window tinting is one of the best things you can do for your car. But if you’re like most drivers, choosing between different car window tint shades can feel like a bit of a mystery. After all, any tinting is better than none. But some are more effective than others. We’ve put together a brief guide to help. Believe it or not, state laws limit how dark of a tint you’re allowed to put on your car. In Arizona, you’re legally required to limit window tint shades to allow no less than 33 percent light. This helps keep law enforcement safe when pulling drivers over. The more they can see in the car, the better they can assess the situation. Window tint shades with tint levels at 50 percent are almost clear. But they do reduce UV light and help keep your car cooler in full sun. But if you’re looking to increase privacy and want to block even more light, choose a darker tint. Regardless, any tint shade will help lower the interior temperature of your car at least a few degrees. Some people like the look of dark windows on their cars. Others prefer clear factory glass. Before choosing the right car window tint shades, make sure you’re comfortable with how it will look on your ride. If you want to make the car look sleeker from the outside, darker tints may be the best option. But if you want to keep the look as close to factory-original as possible, choose a lighter tint. 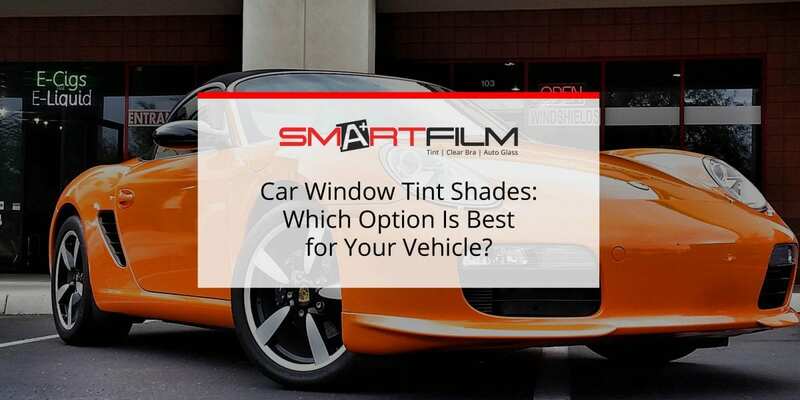 You don’t have to choose between car window tint shades on your own. Contact us to schedule a free consultation and estimate.